Josh Brolin is starring in the new Coen brothers film Hail, Caesar! which opens on February 5. While chatting with him for the comedy about the golden age of Hollywood, he talked a little bit about another role he’s playing; Thanos, in the Marvel Cinematic Universe. We’ve already seen his face and heard his voice, but we’re going to see more of him in the films leading up to the two Infinity War films. Brolin gave us a quick look into doing the motion capture for the Marvel villain, the number of cameras filming him and how he feels about the decision to take the role. 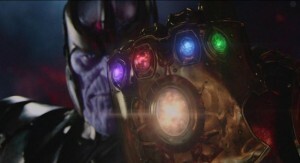 Avengers: Infinity War Part I will hit theaters on May 4, 2018 and Infinity War Part II on May 3, 2019. Brolin stars as Hollywood fixer Eddie Mannix in Hail, Caesar! alongside Channing Tatum, George Clooney, Scarlett Johansson, Ralph Fiennes, Tilda Swinton, Jonah Hill and Alden Ehrenreich.